Lined with restaurants, cafes and stalls selling souvenirs, the Explanada de Espana, also known as the Paseo de la Explanada, is a maritime promenade that runs parallel to the port of Alicante. It runs from the Puerta del Mar to Canalejas Park and is one of the most popular areas in Alicante. 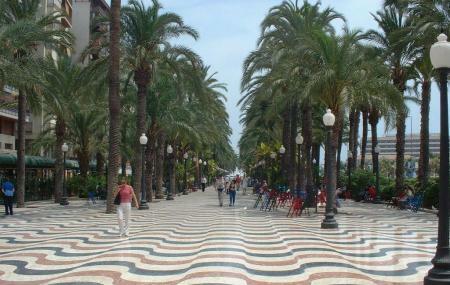 The Explanada de Espana is an elegant boulevard with red, black and cream tiles. It was the brain-child of architect Jose Guardiola Pico who wanted to create a romantic version of the Spanish custom of paseo (evening stroll). Tram stop near the marina. Walkable distance from most of the hotels. How popular is Explanada De Espana? People normally club together Gravina Museum Of Fine Arts and St. Ferdinand Castle while planning their visit to Explanada De Espana. Brilliant location and lovely helpful staff at all times. We asked for extra pillows which arrived immediately. A mirror in the room would have been very useful. Breakfast quite basic but ok. We enjoyed our stay and would stay again. Excellent, clean hotel in a very good location. The receptionist speaks english, friendly and helpfull. I stayed in room 204 and it was very clean, and the bathroom was shiny clean to. Well done housekeeping u did a great job! Highly recommended this hotel! Basic 3 star hotel but ideal location. Breakfast basic continental but OK. Room rather on small side but it did have air conditioning! Walk in shower very tight. Great value for money unpretentious small friendly hotel in excellent location.